For the second consecutive year, the Western Bulldogs will set a new membership record, after surpassing last year’s benchmark of 36,213 on Wednesday afternoon. The Bulldogs eclipsed the 35,000 member barrier for the first time in 2015, and will start their push towards 40,000 members after today moving into unchartered membership territory for the Club. Nearly 4,300 members ahead of the same time last year, the Club’s off-field growth has continued into 2016 with innovative membership campaigns such as Lost Bulldog providing a great fillip to the overall numbers. With the Bulldogs winning six of its first eight matches under senior coach Luke Beveridge, the Club has continued momentum on top of the 2015 season that saw the Club play finals for the first time in five years. 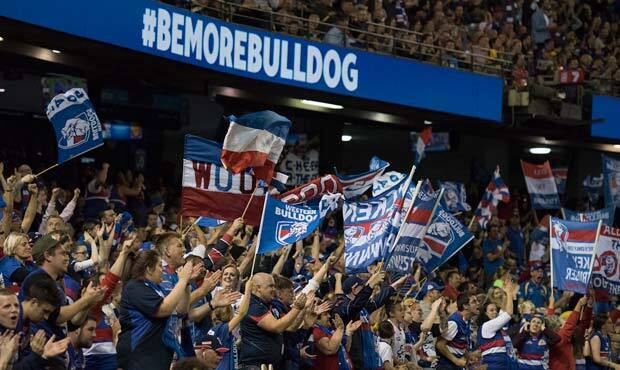 With momentum building both on and off field at the Kennel, Western Bulldogs Chief Executive Officer David Stevenson said it was exciting to see the Bulldogs pack again reach record levels. “We’re really pleased to have surpassed our previous membership record at this stage of the season, and it is something we couldn’t have done without our committed members,” said Stevenson. Stevenson urged members and fans to come together and be part of the journey as the Club makes a bold push towards its next membership milestone. “We’re still a couple of rounds away from the halfway mark of the season, and we’re setting our sights on moving towards our next membership milestone,” Stevenson said. Approaching round nine of the AFL Premiership Season, the Club has six home games to come at Etihad Stadium, in addition to a home game at Cazalys Stadium in Cairns against the Gold Coast Suns. Three game memberships cost just $95, which enables general admission entry to any of the Bulldogs remaining home games, including prime-time Friday night match against Collingwood, and blockbuster Saturday night matches against Geelong, Richmond and North Melbourne.